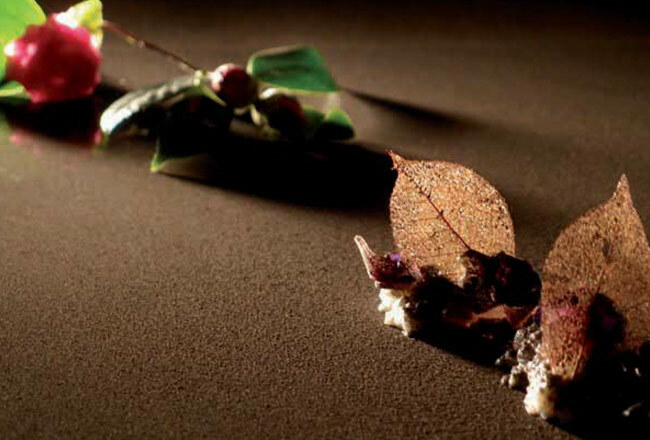 The dramatic way (Arzak), the artistic way (Alinea), the territorial way (DOM) and the conceptual way (Narisawa). 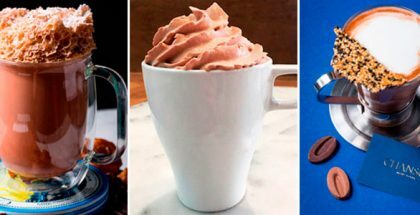 These are four very personal ways of successfully facing desserts in five great restaurants in four continents. Alongside the Spanish chef, Juan Mari Arzak, the American chef Grant Achatz, the Brazilian chef Alex Atala and the Japanese chef Yoshihiro Narisawa, we look at their particular points of view when facing the dessert station. As is only natural, we follow their reflections by showing their past and present desserts at so good #14. All great desserts despite being radically different from each other both in discourse and in presentation. Here we start a tour of four restaurants. First, if you want to get into Japanese cuisine, into their ingredients and ancient culture all while enjoying a spectacular dining experience, there is nothing like going to Narisawa. Praised by critics, this gastronomic temple masterfully lead by Yoshihiro Narisawa offers a unique route through Japanese traditions, enlarging them and at the same time modernizing them with sense. 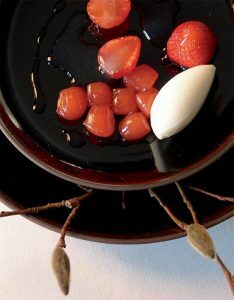 As it could not be otherwise, this gastronomic journey has its continuity within the restaurant’s sweet proposals. We could highlight that the desserts in Narisawa transmit balance through such a seemingly simple yet meticulously studied presentation. We might also note that the desserts in Narisawa are modern, since they combine modern techniques and provide a crafted balance in textures. But above all, what we must do is stress that the desserts at Narisawa are a history lesson, a chance to discover unimaginable aspects and ingredients of Japanese culture. 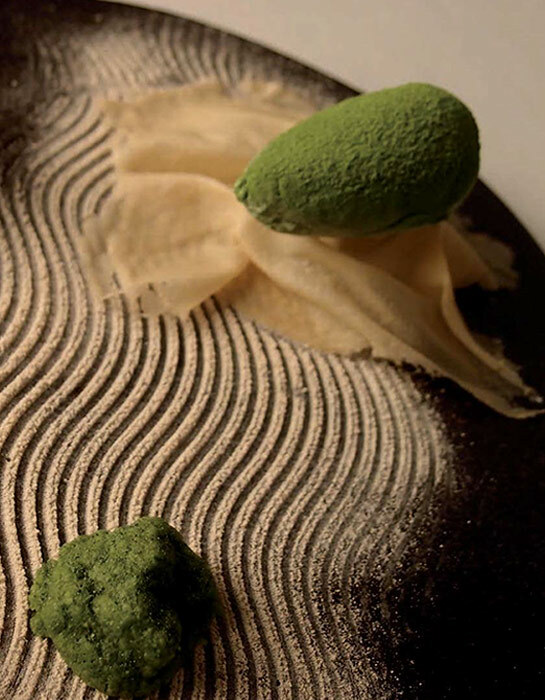 As Yoshihiro himself explains, ‘as in my kitchen, Japanese ingredients are the main protagonists of my desserts, and through them I seek to express Japanese culture and our seasonality’. For this reason, the chef emphasizes that the desserts are part of the Narisawa experience, so it cannot be seen as a world apart from the menu. This dish is a homage to the ever-present, secret relationship between the Tsubaki and Aspergillus Oryzae (Kouji). The oryzae is a mold, kept as a treasure from long ago (1000 years into the past), and passed down from generation to generation. It is in fact the Japanese national mold. Carrying the power of ‘fermentation,’ the microbe Oryzae converts soybeans into miso and soy sauce, rice into sake, mirin and vinegar, and creates virtually every Japanese condiment outside of salt. This tiny, tiny chef is the backbone, the shadow, of all the Japanese culinary culture. To help guard this mold, and to keep its history unbroken, Japanese people came to use a powerful disinfecting agent: ash from a Tsubaki flower. When mixed with Aspergillus oryzae, Tsubaki flower ash kills all other fungi, while the oryzae alone grows. This dessert uses no sugars, and is sweetened with only the power of fermentation. And obviously, the Japanese influence is also carried over to the creative process: ‘I mainly use the Japanese dessert technique with Japanese seasonal ingredients to make the dessert that they can have only in Narisawa’. 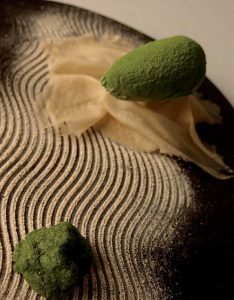 Therefore, it is essential that Yoshihiro properly explains the particularities of his concept to Kanako Sakakura, the pastry chef who then shapes the chef’s desserts and ideas. ‘I explain my concept correctly to her and the importance of the imagination like a client. I make her think how Narisawa’s dessert should be. After explaining those, I let her create freely’. So for a dessert to end up in the menu, the chef gives great ‘importance to light aroma, temperature and texture that cannot be brought home. The dessert time should not be the time to enjoy the afterglow of the meal’. Thus, issues such as the balance in the flavors, aroma, temperature and texture must be perfectly integrated into the dessert in order to be considered a success in the restaurant. And Yoshihiro finishes by highlighting what strikes him the most in the desserts he makes: ‘The live feeling just before finishing the dessert. It’s a very brief thing that changes in a few minutes’. 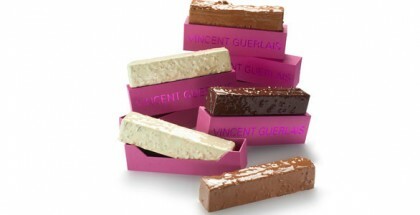 And namely it is that the desserts are able to convey an incomparable sense of life.